The season to relax yourselves is here! Soaking in a hot tub or relaxing your mind, body and soul under hydrotherapy is all that you need after a long day at work. But then, few of us most often get confused with the terms ““hot tub” and “Jacuzzi” which are often used equally to describe their functionality. One is above the ground portable spa popularly known as hot tubs and jetted bathtubs or Jacuzzis. So, here we would want to throw some light upon these units offering you the best relaxation. Hot tub refers to an above-ground, completely self-contained portable spa. Its complete plumbing, electrical control system and components are built inside the hot tub cabinet. If we go by the dictionary definition: A Hot Tub is a large tub or small pool full of heated water and used for hydrotherapy or pleasure. Some have jets for massage purposes. Hot tubs are also known as spas or by the trade name Jacuzzi. Hence, a confusion exists here – a hot tub is not a spa and certainly not a Jacuzzi. A hot tub is actually a wooden tub with a simple bench seat, and 4-8 jets around the side. It’s a hot soak, without noisy equipment and turbulent bubbles bouncing anybody off the seat! A hot tub can be filled with a garden hose and can be drained and cleaned anytime. One of the best feature of hot tubs is that they can hold a set temperature. Benefits? Well, changes in temperature can improve your blood circulation and aid in lymphatic drainage, while pressure can help relieve aches and pains. Such products with technological benefits are available at Verdure Wellness. Hot tubs have come a long way as compared to the past and now also offer therapies for ailments such as sports injuries, muscle soreness, arthritis, and tendinitis, among others. Jacuzzi is like a brand name (Like Xerox, the brand name has been used to refer to the entire category of products!) that is often heard when referring to an in-ground spa, a jetted bathtub, or an above ground portable spa or hot tub. 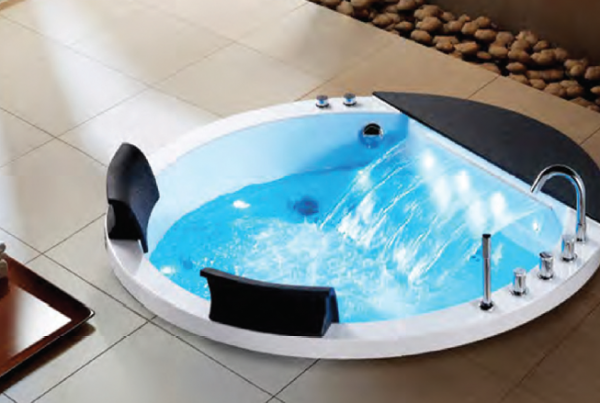 The brand Jacuzzi makes bathtubs as well as portable hot tubs. But,as Jacuzzi is a brand name, it’s a good thing to recall that not every hot tub or jetted bathtub is a Jacuzzi. So, if it is a Jacuzzi Spa, you can call it a Jacuzzi. Otherwise call it a Spa, but do not call it a hot tub.The high-pressure hydro massage with warm water in Jacuzzi that is directed to specific parts of your body can help one relieve hidden aches and pains. Do opt for a Jacuzzi tub installation to invigorate your senses and feel healthy. Hope these differences clear up your confusion about hot tub, spa or those hot water hydrotherapy terms. Share your related queries and comments below. Follow us on Facebook, Twitter, LinkedIn, Instagram and YouTube.